Articles tagged "Just for Fun"
Want a Better LSAT Score? Go to Sleep! This is going to be a short post. It will also possibly have the biggest impact on your study of anything you do all day (or all month!). When people ramp up to study for the LSAT, they typically find the time to study by cutting down on other activities—no more Thursday night happy hour with the gang or Sunday brunch with the family until the test is over. There are two activities, though, that you should never cut—and, unfortunately, I talk to students every day who do cut these two activities. I hear this so much that I abandoned what I was going to cover today and wrote this instead. We’re not going to cover any problems or discuss specific test strategies in this article. We’re going to discuss something infinitely more important! Period. Never cut your sleep in order to study for this test. NEVER. Your brain does not work as well when trying to function on less sleep than it needs. You know this already. Think back to those times that you pulled an all-nighter to study for a final or get a client presentation out the door. You may have felt as though you were flying high in the moment, adrenaline coursing through your veins. Afterwards, though, your brain felt fuzzy and slow. Worse, you don’t really have great memories of exactly what you did—maybe you did okay on the test that morning, but afterwards, it was as though you’d never studied the material at all. There are two broad (and very negative) symptoms of this mental fatigue that you need to avoid when studying for the LSAT (and doing other mentally-taxing things in life). First, when you are mentally fatigued, you can’t function as well as normal in the moment. You’re going to make more careless mistakes and you’re just going to think more slowly and painfully than usual. Second, your brain continues to form new memories as you sleep. When you are trying to remember a bunch of new rules or solution strategies, you need good sleep to help cement that information in your long-term memory. In particular, when you’re studying a bunch of new things at once, you need your memory to make strong and distinct memories. Otherwise, your memory won’t be able to retrieve what you need, or it’ll mix up multiple memories—and that obviously isn’t what you want to happen on test day. 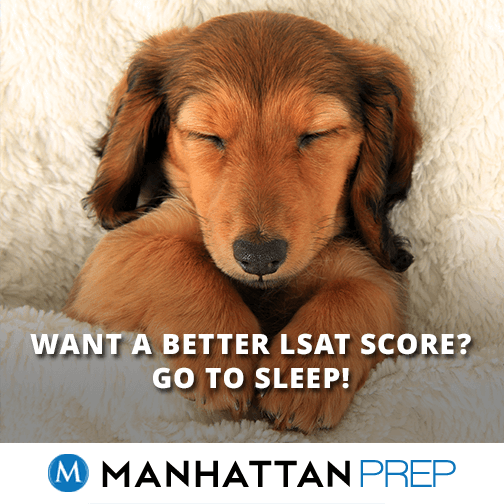 Many people aren’t getting adequate sleep even when they’re not taking on a challenge like the LSAT, and their lives are messier as a result. Make sleep a priority. Your brain will thank you. Stick to your normal exercise routine, whatever that is. For some people, that means walking to do all of your errands and carrying things home, or cleaning the house. Some people play sports. Others hit the gym multiple times a week. The point is to keep doing what you normally do; don’t try to increase your study time by taking away from your second-best recharge time (after sleep). Exercise helps you to get rid of stress and generally gain a boost of energy. There’s even a two-for-one bonus: regular exercise helps you sleep better at night. A bonus piece of advice. I started this post talking about giving up some regular social activities to make time for studying. You are going to have to make some sacrifices, of course, but don’t become a hermit. You do need breaks and you do need to keep up with your social connections. When I’m studying intensely, my rule is that Friday is a no-study zone. That day, I take a break and do something that I want to do.